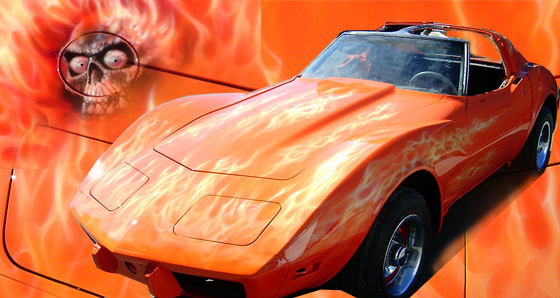 I have been airbrushing murals, flames and lettering on vehicles, including hot-rods, trucks, motorcycles and helmets for over 20 years. All work featured here has been completed in the last 6 years. I will be updating this section as work is completed. I also do bodywork and base/clearcoat painting including pearl and candy finishes. I do work on bikes from all across North America and Canada. Tins can be shipped inexpensively from almost anywhere. email me or call to discuss your project. I use PPG and House of Kolor paint. I can work with your ideas or come up with an original design or artwork that will make your bike or vehicle one of a kind.